Robert Capa (1913 to 1954) is emblematic of a unique period in the history of photography. When Capa was at his prime he was seen by many as one of a breed of photographers which has not existed in the same way since; these were the individuals who personified the adventure of a life spent travelling punctuated by attendance at the seminal moments in contemporary history. Perhaps as a precursor to his career, Capa’s early life was spent on the road. He was involved in protests against the fascist government in his birthplace, Hungary, and was forced to resettle in Germany. The rise of the Nazis and Capa’s Jewish religion meant that the photographer moved again, this time to France. A period of difficulty finding freelance work there meant that he eventually ended up in Spain, arriving just before the start of the Civil War. In 1936, the first year of the war, Capa produced the image that went on to define his career. The photograph, of a Loyalist soldier at the very moment of his death on the Cordoba Front, has become known as one of the greatest war photographs of all time, capturing an intensely personal incident and yet one which is horrifically commonplace during a period of war. Indeed, the image itself is enormously atmospheric for compositional reasons; the falling soldier has been jolted backwards, his machine gun about to be flung from his hand. The subject occupies the left-hand half of the frame, giving an impression of frantic movement as Capa was clearly tracking the subject at the time of his shooting. While in Germany Capa had assumed German citizenship and, when the Second World War began, this enabled him to negotiate entry to areas which were very much off-limits to other photographers. Having been sacked by Collier’s Weekly, Capa was taken on by Life Magazine and spent the rest of the war travelling the European theatres. His work became the means by which many Americans and Europeans watched the war panning out. 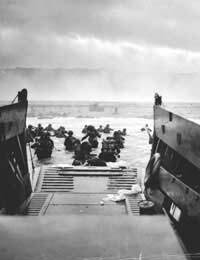 On June 6th 1944, Capa swam onto Omaha Beach with the very first wave of D-Day soldiers. It was on this day that he made his most famous work, documenting that historic day. Having sent the 35mm rolls from his two standard Contax cameras back to the Life offices, Capa was not to know the disaster that would befall them; a young darkroom assistant, realising that he was developing some of the most important images of the Century, overheated the chemicals and melted the negatives. As a result, the now-blurred series appeared in Life with an accompanying text stating that Capa’s hands had been shaking from fear and excitement. This claim was, of course, false. While Capa became known, even in his own lifetime, as perhaps the greatest war photographer of all time, he was understandably unenthusiastic about his job. He repeatedly and publicly wished that he could be put out of employment by a cessation of violence, but until that occurred he would do his best to tell the truth photographically. Aside from his images, perhaps the most defining element of his legacy is his most famous quote: “If your pictures aren’t good enough, you’re not close enough”. This philosophy ultimately led to tragedy, when Capa stood on a landmine while covering the Indochina war in 1954. He died in a Vietnamese field hospital.